Traditional Christmas decorations can quickly get expensive and extremely wasteful. But you can change that in your home this Christmas season by turning everyday household items into holiday decor. All you have to do is take a shopping trip through your house and upcycle old stuff into Christmas decorations. With just a little time and creativity, you can create these holiday decorations for just pennies, and keep the waste at a minimum. All you need for this project is some raw bowtie pasta, cardboard plates, a hot glue gun, and spray paint. 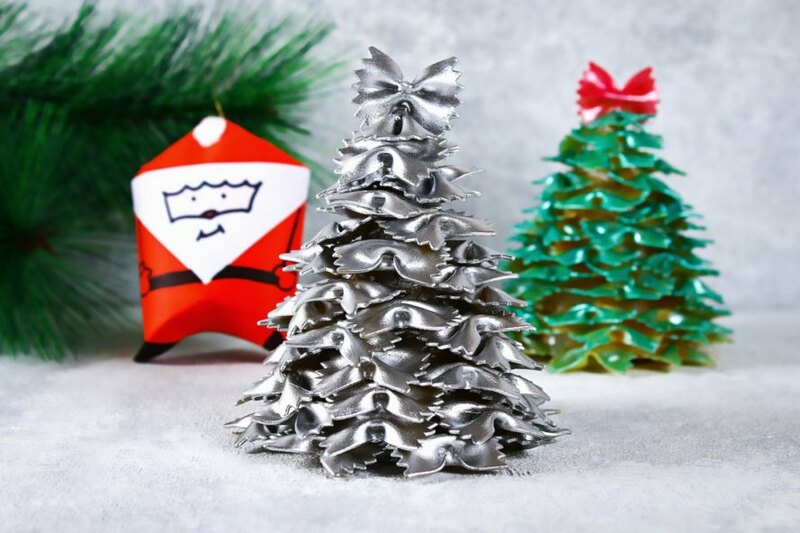 Choose a color of paint that will match your holiday decor, like silver, gold, or green, and paint your pasta before gluing the pieces together to make a tree. This is just the beginning. You can also use penne rigate, fusilli, rotelle, radiatori, ditali lisci, or pasta shells to make a variety of different ornaments. When you watch the video tutorial for this craft, it will give you a creative spark. And, the surprising thing is, the holiday decorations and ornaments don’t even look like pasta when you are done. This is a craft idea that you can do with the kids. All you need is some toilet paper rolls, colored paper, a marker, glue, scissors and string. First, measure and cut a piece of red paper that will fit around the toilet paper roll, then use your marker to draw bricks. 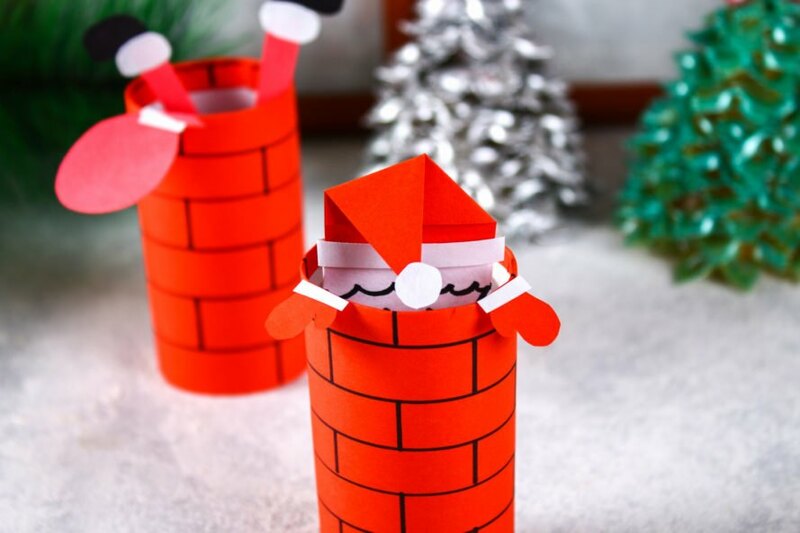 Glue the red bricks to your toilet paper roll, then use the red paper again to cut out Santa’s legs and part of his hat. You will need white paper for the “fur trim” of Santa’s hat and pants, and black paper for the toy bag, feet and mittens. If you have some old sock monkeys hiding in the bottom of the closet, or have some sewing skills, you can create some cute sock monkey ornaments to put on the tree. All you need to make your own sock monkey is a pair of socks, two buttons, cotton stuffing or polyester fiber, scissors and some needle and thread. Another super easy idea for upcycled holiday decor is a Christmas tree made from wine bottle corks. You can paint the corks or decorate them with buttons, glitter, and textiles before tying them in red ribbon. 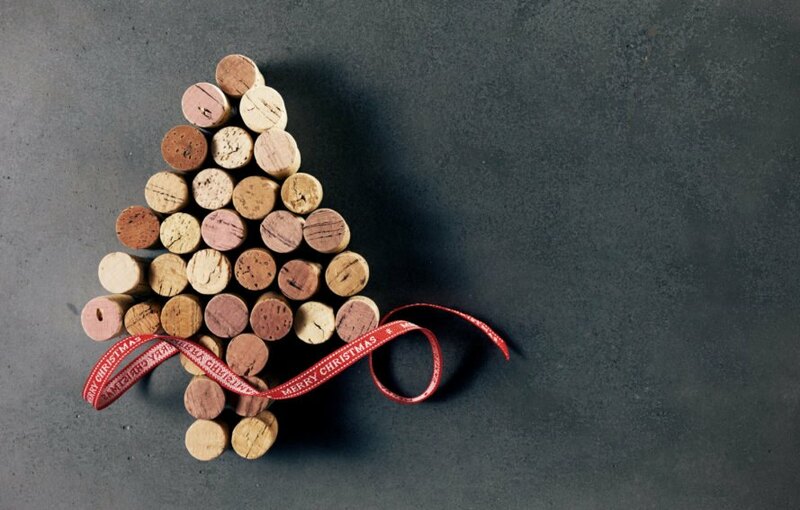 Or, you can keep it simple and arrange plain corks (possibly with some red wine stains) into the shape of a tree. Then glue them together and add a decorative ribbon. 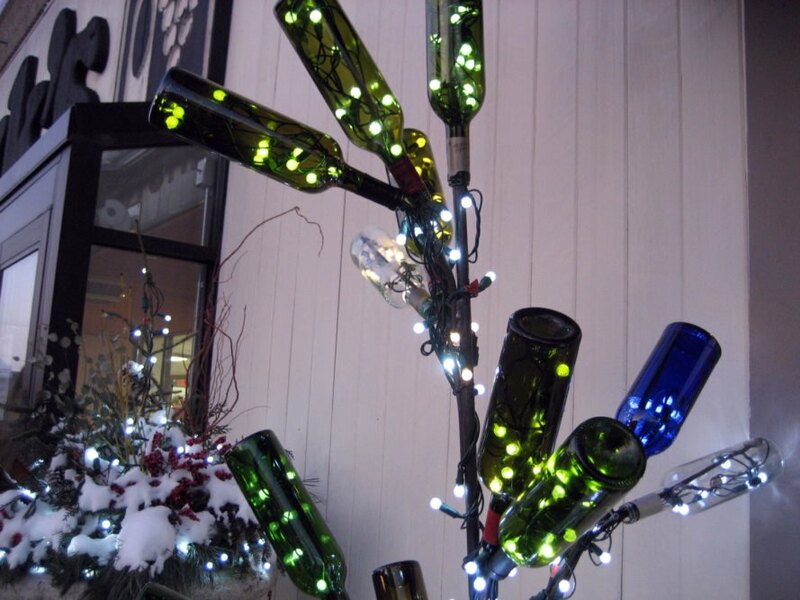 With some rebar, wine and/or liquor bottles, and a few strings of Christmas lights, you can create your own bottle light tree to light up your front yard. The possibilities are endless with this project, and the bonus is you have to drink some booze to make it happen. 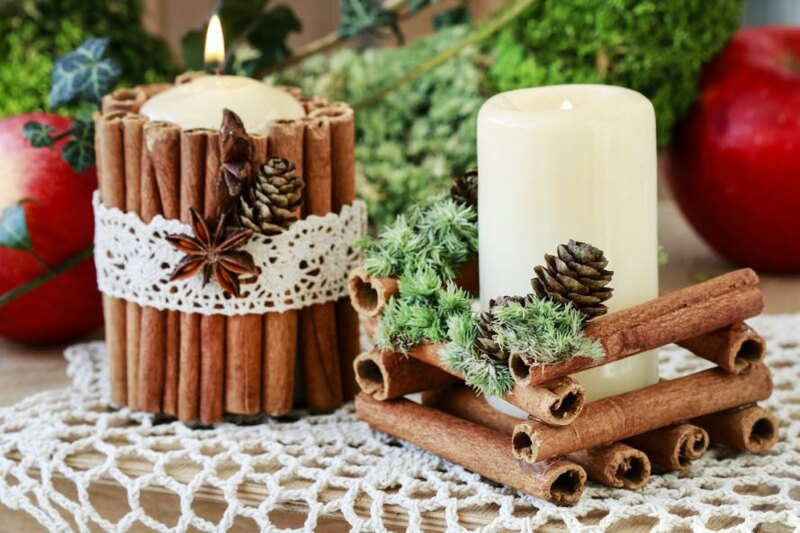 All you need for this idea is some cinnamon sticks, hot glue, some ribbon or lace, and a few holiday embellishments that you can find in your yard, like pine cones. And, in just a few short minutes you will have custom candle holders that will make your house smell amazing throughout the holiday season. You can take this idea and run with it any way you like. You can use plastic containers or mason jars to house trees you can make from paper. And, you can use cereal and snack boxes like BettiJo at Paging Super Mom to create your village. Do you have some old computer parts, cell phones, and cords taking up space in your home? Well, stop letting them collect dust and turn them into a holiday wreath. 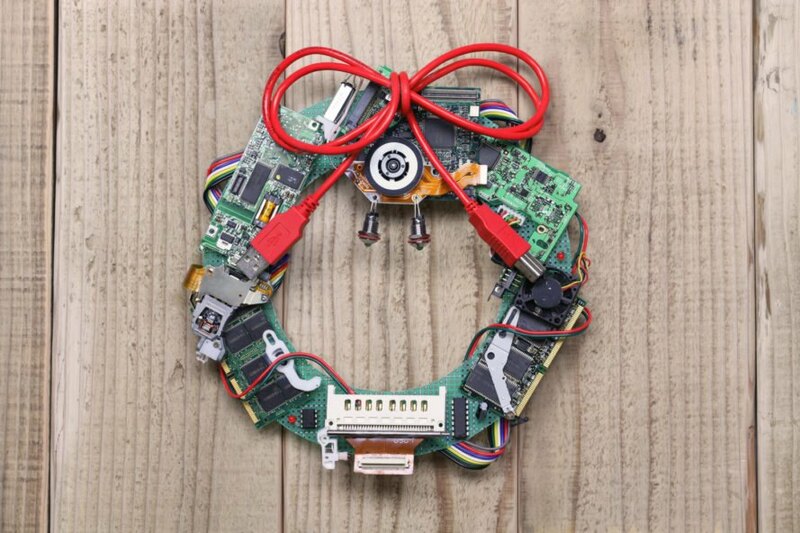 All you need is a wreath form and some old tech to create this cute, geeky decoration. This upcycled holiday decor idea uses old light bulbs, paint, and some ornament hangers. You can add them to some garland or hang them on your tree. And, if you want to take this idea to another level — and you have some art skills — you can turn the light bulbs into reindeer, snowmen, Santas, or even a grinch with the right paint and crafty accessories. It doesn’t get much easier (or cheaper) than this. You will want to start by creating a holiday image with vintage angels and stars, or any other Christmas-inspired thing you can think of. 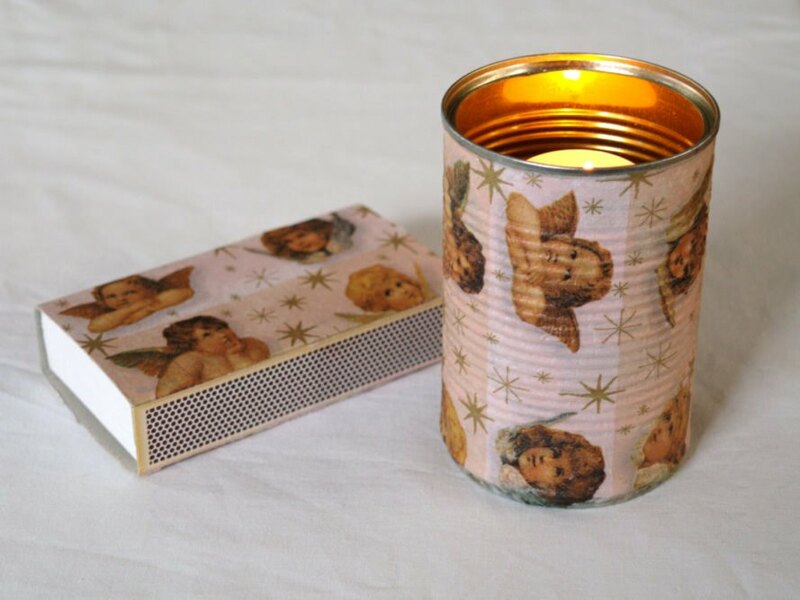 Then, print out your design and cut out a piece that will fit around a soup can and another that will fit a box of matches. Finally, glue or tape the pieces to the can and matchbox, just don’t cover the striking surface on the box! Use your favorite pasta and turn it into a mini Christmas tree! Don't toss your toilet paper rolls. Instead make clever holiday themed decor! Customize a sock monkey this holiday season! Save your wine corks and make adorable little Christmas trees. Empty wine bottles can be transformed into anything but look great as a Christmas tree. Can't find that special candle holder? Make it from cinnamon sticks! Turn old plastic containers or mason jars into a little village. Have extra cables around the house? Turn them into a beautiful wreath! 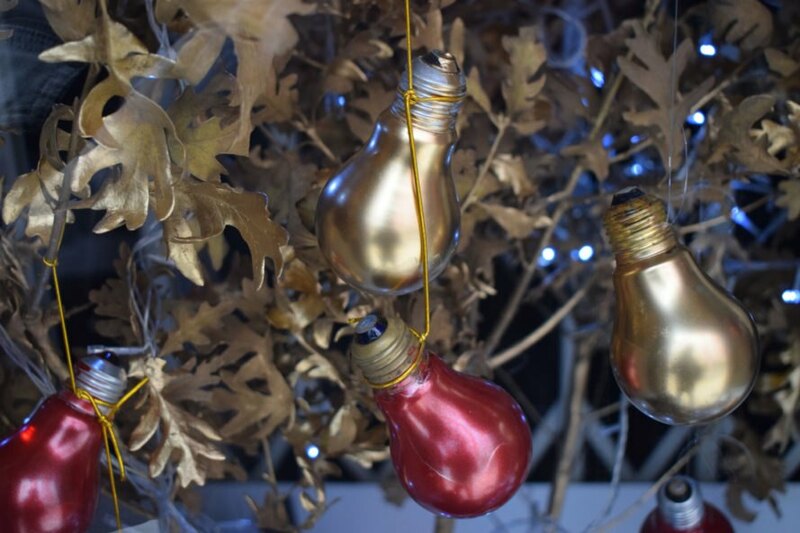 Upcycle light bulbs into a one-of-a-kind ornament. Use soup cans as lanterns this holiday seasons to light up your home!